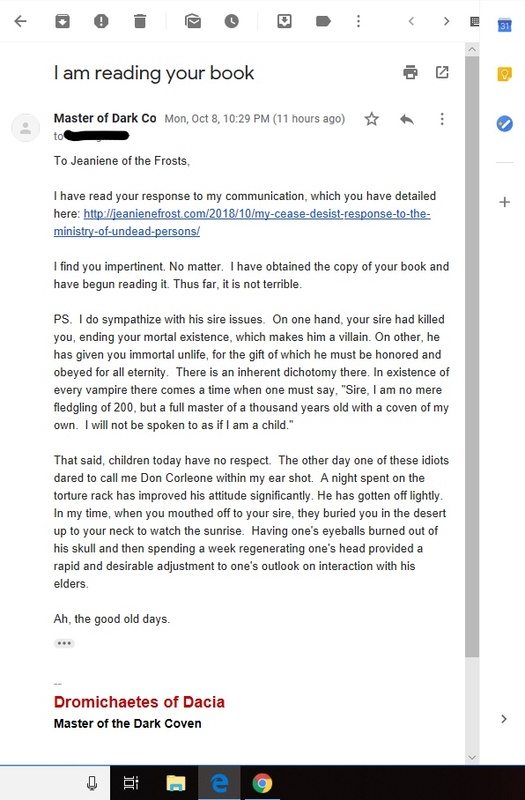 So Jeaniene Frost responded to the vampire letter, and then I got CC’ed on this. This is getting more ominous by the minute. It’s good there are not a lot of deserts in Florida. Dad issues among the vamps, hehehe! So much fun. Don Corleone indeed! I wonder if werewolves feel bothered too?? Lol. Oh my god. Sitting in my car reading and laughing… (am parked read before getting out) …. this is too funny for words. This becomes even more poignant when one realises that the only desert we have here in the Transylvanian mountains is full of mud volcanoes that violently spit out boiling tar all day. The complection takes DAYS to recover! It’s really funny after reading Ilona’s post about her father coming. And you thought you had it bad, Ilona, being in your 40s and your dad still lecturing you. Imagine being 200 years old and still having to go through that! What is the lifecycle for a vampire? When do they hit puberty? When is their brain fully cooked? It may be that 200 is when they hit their rebellious phase and start wearing silver jewelry in delicate places just to irritate their sire (they probably can’t get tattoos). At least they have a natural curfew – sunrise. Maybe around 500, they are responsible enough to get an apartment and live on their own unless – are there boomerang vampires? Just when you’ve redone their room into a walk in closet, they inform you they’ve lost all their money in a pyramid scheme selling SPF 5000 sunscreen for the solar sensitive and have to move back in. Tsk, tsk. Again the Transylvanian Coven Master uses the American dating convention (month/day/year) rather than the European one (day/month/year) . Maybe he can blame email software this time, but the previous correspondence was by snail mail. You’d think since he is such a stickler for tradition, he would observe the traditional dating convention, not choose the American way! Maybe he is dictating the letter to a scribe and the scribe had studied in a university? Ha! Autocorrupt has no respect! Not even for thousand-year old Master Vampires! Are you trying to kill or embarrass me? Last night snippet almost gave me a heart attach and today I’m peeing myself laughing. Don Corleone. ha ha ha love it. I think we need a book about Dromeo as well!! For some reason this correspondence string reminds me of James Veitch’s Elaborate Wrong Number Prank – its so wrong its right. I like James Veitch! His roommate prank was funny too. Thanks for the link. I watched the video. And then watched 3 more of his. He’s hilarious. This just goes to show you that no matter the race, species or monster, everyone has some type of family issues. Age demands respect only in areas that try to prevent its acquisition, youth is generally impatient to be recognized as mature and longevity only exasperates the issue. As the centuries go by humor changes. I am surprised that he even knew who Don was and am grateful that he didn’t confuse the issue with the other one, if he had, the desert punishment might have seemed like a vacation instead to the younger vamp. ok, I was waiting to see if I was the only one rolling on the floor overcome with laughter at Jeaniene’s description of Vampires in Kate’s world. I know she must be referring to those vamps and not the InnKeeper Vampires as I really can’t imagine Arland carrying a message in his (ahem) “prison pocket” OMG – this floor is cold and uncomfortable – must. stop. laughing. This exchange is hilarious! Thanks for the much-needed laugh! I am loving this dialog It is sooo much better than the news For all the fans living in FL please be safe and prayers go out to you. This is great! Totally live this!